The American 180 is a .22 rimfire submachine gun that fires at 1200-1500 rounds per minute or more, and feeds from drums of 177 to 275 rounds capacity. While it makes a great recreational machine gun, it was actually initially developed with law enforcement sales in mind. The notion was that the .22LR cartridge posed a minimal danger of overpenetration and was extremely easy to control, and the many repeated hits that could be made with the American 180 would make up for its lack of ballistic effectiveness. And that’s not necessarily incorrect. Several law enforcement agencies did actually buy the guns, and one police shooting involving one is documented, from 1974. It never became really popular with police agencies, though, and production basically ground to a halt in 1986 when it became impossible to manufacture new machine guns for the civilian market. interestingly this weapon belongs to rare category of multi-barrel sub-machine gun. it might be found in “standalone” version representing DP, DT, DA or sub-machine gun or attached to DP or Maxim machine gun. It uses 39-round drum magazine. I wonder how long belts can be used without malfunctions? It would be great if you could take a look at the “succsesor” of the American 180 – the Slovenian produced MGV 176. It’s design came from the Voere copy of the American 180, and saw limited use in Slovenian war of independance in 1991, and was considered for police use, instead of shotguns. If I got it right, american was made in austria by voere and than imported to usa. Mgv 176 was a design sold from voere to gorenje, as the same one was seen (plastic with folding stock)on some blueprints and brochures of voere from 70s. Also take note that austria and slovenia share the same border. .22lr at that rate of fire, with no recoil would have the effect of buckshot without the drawbacks of harsh recoil and low number of follow-up shots. If Ian’s comments about the lack of movement while firing aren’t exaggeration, it would be even more accurate than a shotgun as well. The Armory Museum here in Frankfort, Kentucky has many examples of experimental weapons, which they sometimes put on display. One I saw there many years ago looked at first like a modified M1911. It had two complete .22 LR full-auto pistols in a single frame and grip, with twin magazines. IIRC it was evaluated as a downed Air Crew survival sidearm. Was it maybe “policarpa” 22lr smg? Do you have a photo? Sorry, no. This was decades ago. The Armory Museum was just a couple of blocks from where I worked and I used to walk over there during my lunch hour. I never thought to take photos. A drum mag version would be a logical gimmick for them. 1200 rounds per minute implies 0.05 seconds/shot. I have it at 0.034 to 0.036 seconds/shot. This is slightly more than 1700 rpm. Incidentally there is a lot of noise when the first round is fired, which I attribute to the ammo “sloshing” (my apologies to non English readers) in the drum. Technically that’s a pan magazine, not a drum. Larger pan magazines for rifle-caliber weapons (or even heavy machine guns) can be indexed by bolt movement alone, but in general pan magazines are very bulky compared to box magazines, proper drum magazines, and ammunition belts. Did I mess up? Belts will have best results in having lowest possible mass, but require to have proper feeding mechanism in weapon. Pan magazine don’t have to be bulky (see for example DT machine gun magazine for 63 cartridge) and also are suitable for rimmed cartridge (like 7.62x54R or .22 rim-fire), when high-capacity box magazine will have significant curve (see for example Madsen light machine gun) when from point-of-view of spring it is better to have straight magazine. I’m not sure what would be result of making staggered-column high-capacity box magazine for rimmed cartridges – does anyone tried something like this? Big drum magazine needs some effort ergonomic-wise (compare PPSh with drum magazine vs PPSh with box magazine). Yes, pan magazine. At 1700 rpm I asked myself “Is that even possible, and did I mess up?” In the time vs. sound intensity plot that I got 0.035 sec seems right, but is that even possible? Why you think it is impossible? All depends on moving-parts-mass and its travel. Sub-machine guns for bigger cartridges (like 9×19) have most often lower RateOfFire, but this intentional to make it controllable. My apologies, I tried to post earlier, but it didn’t take. At some high rate of fire loading and extraction become important and lowering bolt mass doesn’t speed it up. A round nose rimfire rattling in the feedway seems a logical concern since this gun can fire out of battery when dirty. But really I would like to know more about the limits of high ROF. Ah, I overlook that .22 long rifle is ancient technology which is outside-lubricated, unlike modern inside-lubricated. might work good with high rate-of-fire, as it should provide possibly smooth movement. There is a single shot option (maybe not on this particular gun) that is switched by pushing the pin behind safety left/right (writes semi, the pin is also sear pin), but due to the slightly flawed design, pin is prone to breakage often when fired in semi. So either Ian don’t know about the system, or they (sellers) blocked it in auto only position, knowing about that issue. This is quite peculiar solution, considering that it is 1970s weapon I would rather expect lever for that. Interestingly http://modernfirearms.net/smg/usa/american-10-e.html states that For stationary use in prisons or during riots on the streets, ILARCO provided dual and quadruple mounts for American-180., have anyone photo or drawing of said mounts? You can find pics of quad mount pretty quickly on Google. I read somewhere that the Navy Seals also tested the 180. They said it could pop a hole in a M1 steel helmet after 5 consecutive shots in the same place at 50yds. I recall seeing this demonstrated on the early-’80s TV show “That’s Incredible” — they fired long bursts at a mannequin and a car door. It was startling in both cases to watch it “eat” a hole into the target, from a single tiny .22″ hole up to a gaping 2-3″ diameter crater, in seconds, accompanied by that “angry buzz”. They mentioned at the time that it could do the same against Kevlar vests — as the site Daweo linked to mentions, some prisons that had purchased them for riot control promptly withdrew them from use when they realized that. years ago SWAT magazine did a comparison between a shotgun firing buckshot and a full auto ruger 10/22..the ruger actually did rather well. they liked being able to place each bullet and apply only as many as needed..something you couldn’t do with the shotgun for obvious reasons. On the other hand, shotgun can fire less but heavier pellet. For example US forces in WW1 used cartridge containing nine .34″ pellets (now known as 00) in each. they compared the velocity and weight of the pellets and the .22 bullets and they were very close to each other. I wish I could find the article. SWAT magazine has changed hands a few times and I think this was before the current owners, so they aren’t interested in putting it up online. The concept of this SMG is perhaps viable, but I think .22 lr was a suboptimal choice. I think .32 ACP would have made more sense for many reasons: it’s centerfire and only semi-rimmed, which would have improved reliability and made conventional box and drum magazines easier to design. It also reaches practical maximum muzzle velocity from about 8″ barrel with typical loads, so you could make the weapon shorter and more compact. The only real downside of .32 ACP is higher recoil impulse, but in practice that would probably not have been a significant issue. 71 grains at about 1050 fps is still pretty small momentum compared to for example 9x19mm. It’s similar momentum to typical .22 WRM loads from a rifle barrel. I have not shot the Czech Škorpion SMG, but people who have usually describe the recoil as minimal despite the low weight of the weapon. Also default bullet is FMJ (“Ball”) unlike .22’s LRN, which might result in better reliability and improves penetration, but on the other hand it might be drawback if this weapon is to emulate shotgun with limited penetration. Other possibility is .25 Auto, which was used in Lercker machine pistol (I don’t know about any .25 Auto sub-machine gun), as it is also center-fire and semi-rimmed, but lighter than .32 Auto (thus more .25 Auto cartridge can be carried). Other possibility is .22 rim-fire belt-fed, which would allow high-capacity without need to design magazine special suited for rimmed cartridges. There isn’t much difference in penetration between a high velocity 40 grain .22 lr bullet from a rifle barrel and a 71 gr .32 ACP bullet. The latter will penetrate a bit better especially through hard materials, but you could limit that by using expanding ammunition, and on the other hand .22 lr copper plated solid bullets are quite good penetrators. It is noticeable that 40 grain .22 lr has a higher sectional density than 71 grain .32 ACP, which compensates for the lesser kinetic energy of the .22 lr. 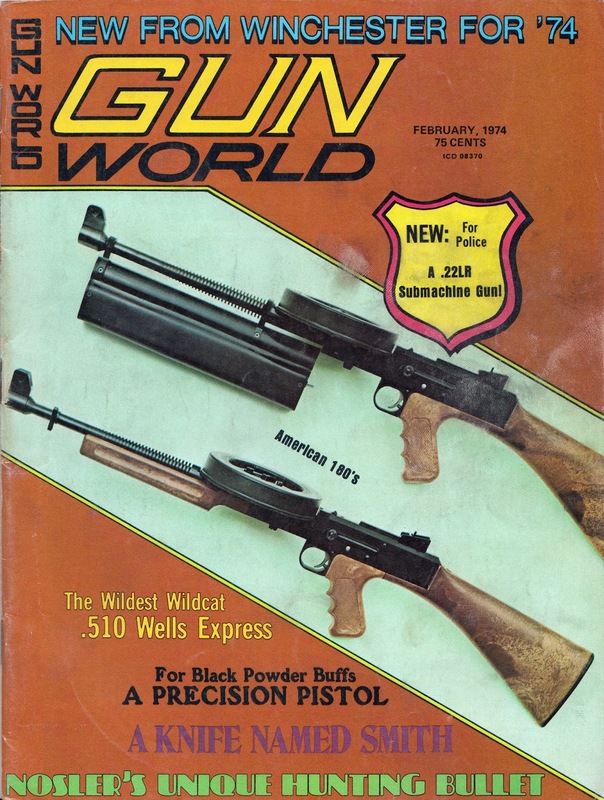 There was an even earlier appearance in Gun World (https://2.bp.blogspot.com/-7TRC7DMSbOI/VutWk3bM6MI/AAAAAAAAEIo/p6BHTSv2RJYWYMpsGVqaX_Prz-QKyYtFg/s1600/Gunworld%2BAM180.jpg)but I only have the picture of the front cover and not the article itself. Thanks for resurrecting this interesting weapon, heralding the arrival of LASER aiming devices! German newspaper article from 1977.Note the huge laser module in the downloadable .PDF’s photos. The article claims that the gun was used by Israeli Commandos back then. On a sidenote, a similar gun was produced in Yugoslavia as the MGV 176.